But is it enough? How does it compare with the Lumia 820? Armed with a watch, a calculator and patience we set off to find out. 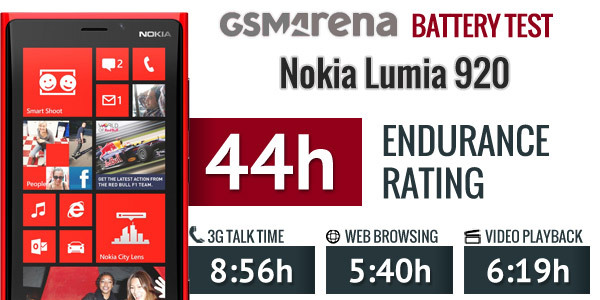 The Nokia Lumia 920 is officially rated at 10 hours of 3G talk time though our tests show it lasts just under 9 hours. This puts it above all other Lumia phones except the 710, which stayed on a few minutes more. It’s also ahead of the iPhone 5 (which has a smaller battery) but behind the Android flagships, some of which managed to last substantially longer. All previous Lumia phones we’ve tested hover around the 4 hour mark in our web browsing test (even the new Lumia 820), so the 5 hours and 40 minutes that the Nokia Lumia 920 achieved are the best in that range by quite a margin. Again though, most high-end Androids last longer on marginally bigger batteries and similarly-sized screens. The Lumia 920 has a large, sharp display that’s suitable for watching videos and it will last you around 6 hours and 20 minutes (in Airplane mode). That’s comparable to the Lumia 820′s time and around average compared to other smartphones. Standby proved efficient enough and the Nokia Lumia 920′s endurance time came up as 44 hours – that’s the time between charges if you do an hour each of talking, browsing and watching videos per day. It’s 4 hours longer than the Lumia 820 score, so that’s that base covered. If your phone usage habits are similar to our hypothetical usage, you can get two days out of the Lumia 920′s battery. Keep in mind that web browsing over LTE will eat the battery quicker (we do the tests over Wi-Fi), but with a wireless charging pad (which comes in the box for free in some regions), you can easily top off the battery.